I had meetings in Al Khobar in Saudi Arabia. I usually stay in Bahrain but this time I had no meetings there, so I flew direct to Dammam. It was prayer time when I arrived so we waited twenty minutes before the immigration guys returned. One by one. There were four queues by then and they chose to open the windows where no-one was waiting. I think they enjoy seeing the scramble. I did. Unfortunately I didn’t see Al Khobar but I hear from everyone that it’s a beautiful city especially by the Corniche. Departing from Dammam airport is also miserable. It’s a beautiful building with good size halls and check-in desks – but it lacks any life. Once you go through to the gates, there is one shop (like a large Baqala) and a sign for a restaurant that I couldn’t find. 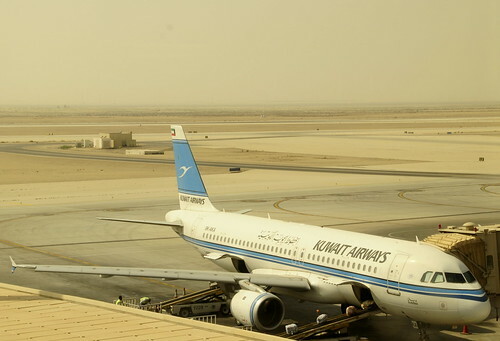 I thought Kuwait airport was bad until I saw this one. The photograph is of the aeroplane I took back. This was the only clean spot I could find on any of the windows. Compare this with Bangkok! I believe “lacking life” is Saudi’s biggest airport problem. On the other hand, have you ever been to the airport in Jeddah, the name escapes me? It is quite a sad sight. It’s a shame, because the airport building from outside is very impressive and the landscaping (I like gardening) is wonderful. I think it sets the expectations too high for what there is (or isn’t) inside. I think Jeddah airport has an excuse to a certain extent. The traffic through it is massive due to Hajj and believe me when I say it’s not the worst airport I’ve seen! Jeddah itself is my favorite city in Saudi – although as I said, I haven’t yet seen Al Khobar. I haven’t ever been to Saudi Arabia, but from what I have read and heard, this picture seems to capture the essence of the country – dull, boring and lifeless. Mecca and Medina are a totally different story all together. I love Jeddah – the old town’s architecture, the modern twist of Arabic culture. I have friends who have summer houses in Abha and spend 2 months a year there (in a green mountain area with clouds entering their terraces). As regards Dammam – yes the above sums it up – but not the whole Kingdom. salam, why did u wait for authorities to come, why didnt u go and pray the salah ?????? How would knowing the answer to your unnecessary question, in any way, benefit you, me or readers of these comments? You have missed the reason behind this post – and frankly I don’t think you will understand it (or would want to) if I paraphrased. So I won’t bother.